Hello my lovelies! It's a sunny and very hot Monday in my neck of the woods. Frankly, I don't mind that the week has started, but that's probably because I love my job. I'm also wearing some gorgeous blue nails but that's a story for the next Monday Blues post. 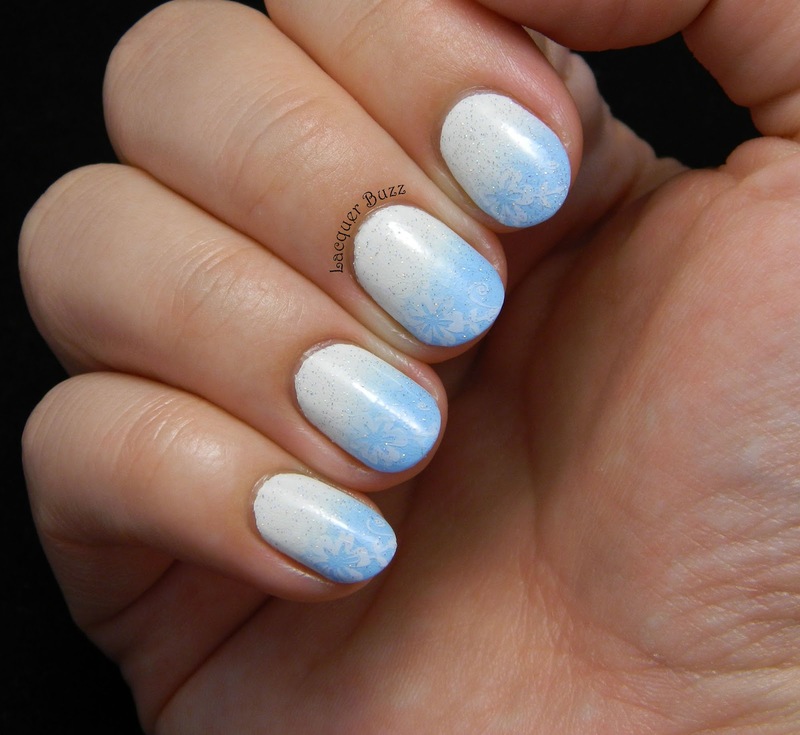 The manicure I'm showing you today is from a couple of weeks ago, when I got inspired by HannahRoxNails' tutorial to create a light blue and white gradient. I really wanted to get some light blue acrylic paint for this but couldn't find any at the local craft store so I mixed white with some darker blue acrylic paint and created the light blue that I used to create this gradient. 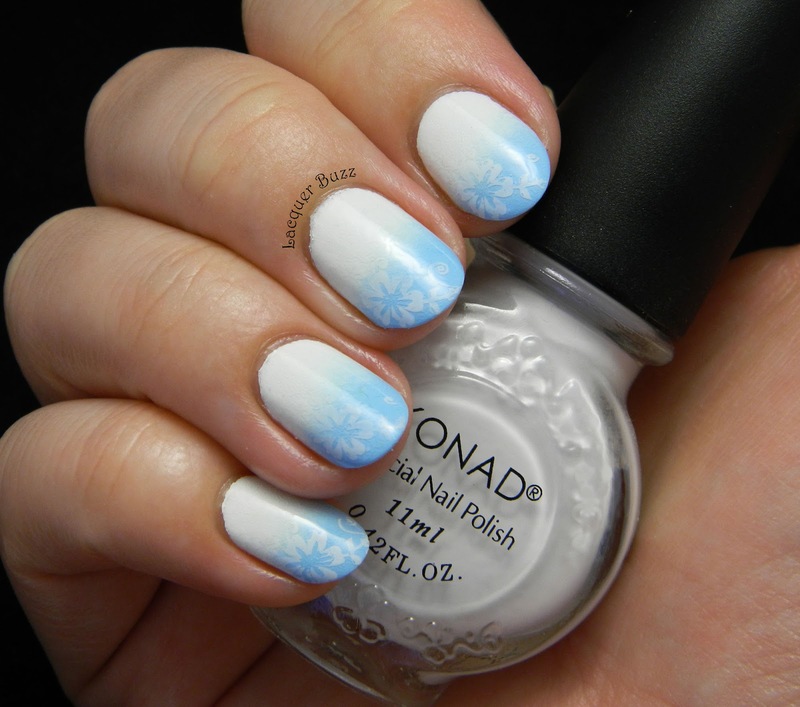 I started with a white base and then used a sponge to create the gradient with white and blue acrylic paint. As I mentioned before, I love doing gradients with acrylic paint because they mix well and the cleanup is very easy. 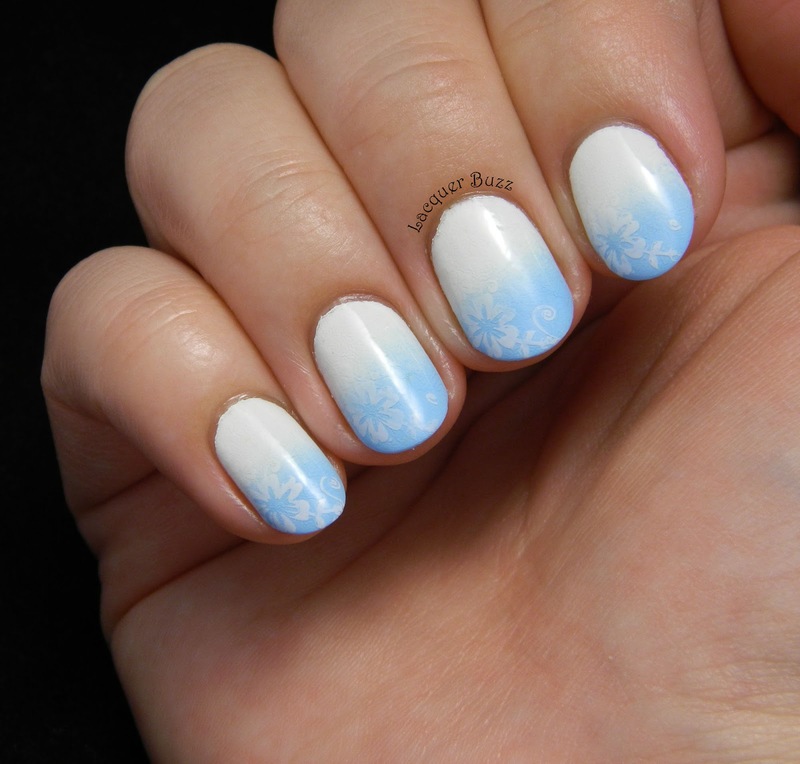 This particular gradient was very simple so I had to add some stamping to it to make it more interesting. I didn't want to cover it too much though so I only stamped a small flower from plate CH26 using Konad White. Subtle stamping is sort of my signature look by now if you haven't noticed. There's something so elegant and beautiful about it. I love it! Finally, I added a coat of INM Northern Lights (silver holo glitter) to make the manicure even more interesting. I think I prefer it without the glitter though. What do you think? 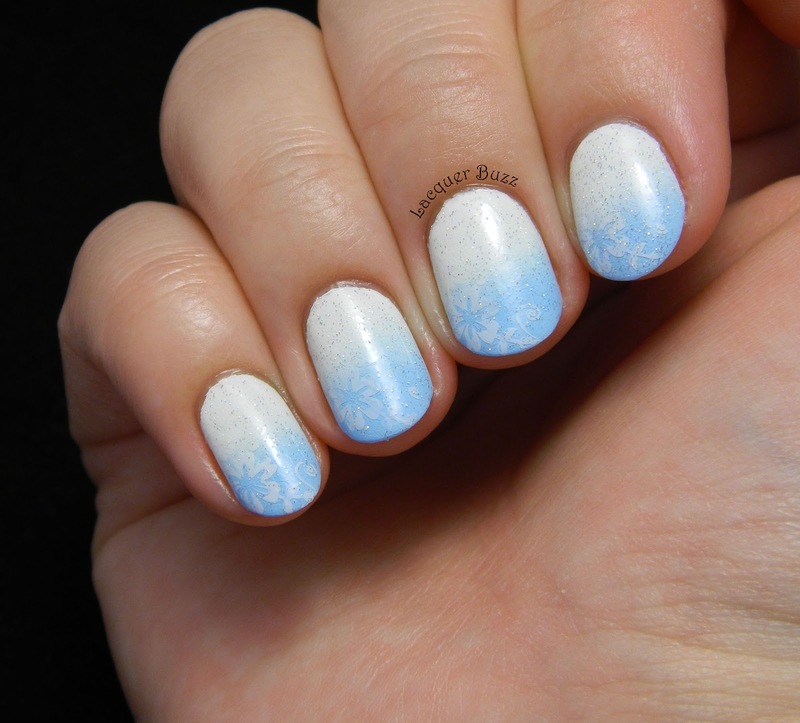 This manicure totally reminds me of the sky and the sea. I love everything about it and I hope you enjoyed it too. Make sure you check out the rest of this month's Monday Blues in the links below! Very pretty subtle blue gradient. 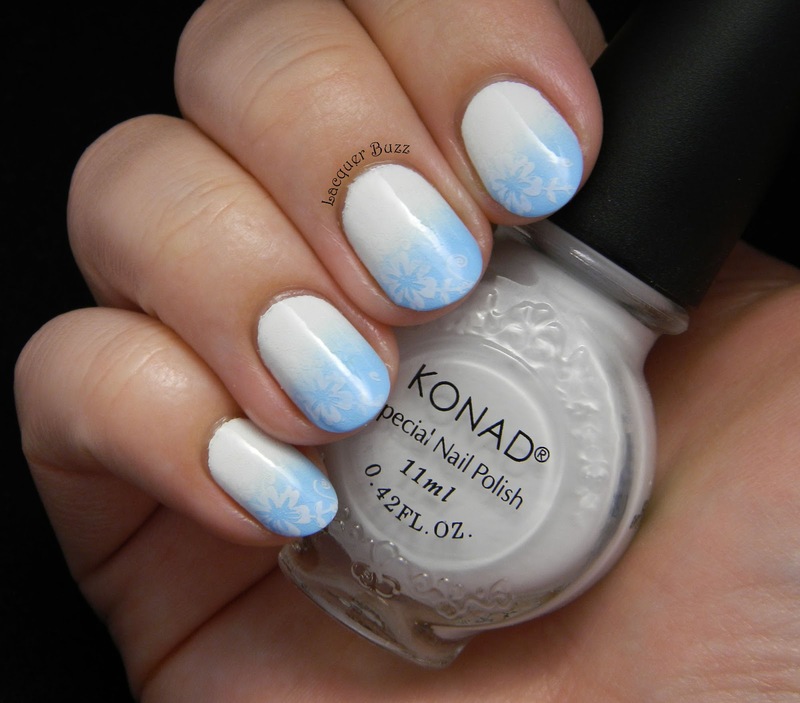 I like the white stamping too!